This Saturday, Oxford Streets finest one stop shop for all things street wear host an afternoon of live music. From the hours of 12 – 6pm get yourself down to the store and enjoy some head nodding music whilst shopping for that fresh addition to add to your wardrobe. As you can see from the flyer artist’s doing their thing on the day are Dj Odin and my man Mikill Pane, definitely both ones to watch, trust me. For your viewing pleasure i’ve put a video of Mikill Pane performing live, call it a little preview if you will….. 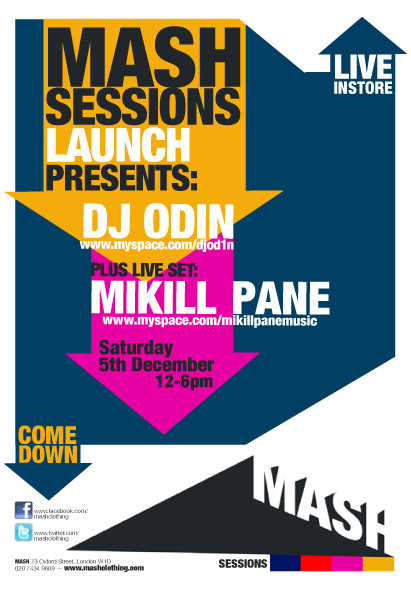 If you want to have a quick listen to the guys playing on the day, hit up Mikill Pane and Dj Odin. Have a good week and let me know what you think?